Effective April 2017, we are assigning new part numbers to our Solar Model 7054 line of spike generators and will no longer be manufacturing the Solar Model 7054-1, -1A or -1B lines. We are now offering the Solar Model 7054-2 Spike Generator, as well as Solar Models 7054-2A and -2B, to continue assisting your testing to Method CS06 of MIL-STD-462, Method 5006.1 of MIL-STD-826A, various missile specifications and other requirements. The Model 7054-2 may also still be used to perform Section 17 testing of RTCA/DO-160G as described below on this page. In short, the specifications, functionality and performance of these updated generators are exactly the same. Why the change? 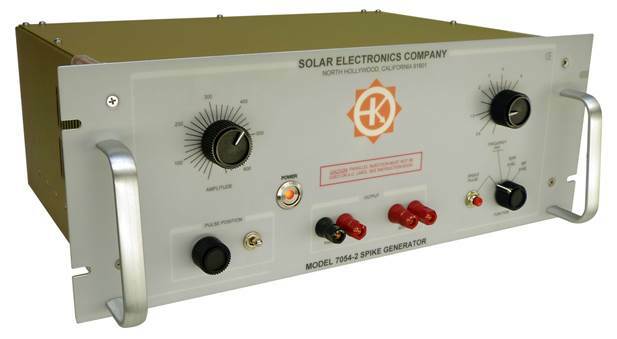 Solar Electronics Company designed and has been manufacturing our Model 7054-1 line of generators since 1970. Over the years, parts have become harder to find or even obsolete. To continue to provide these quality EMC generators, we redesigned the internal circuitry and updated components. This redesign prompted the part number changes and will result in improved reliability, ease of service and better availability of parts. What hasn’t changed: there will be no discernible difference to you, the end user. These generators meet the same specifications with the same performance you have trusted for so many years. For those who have graduated from the 50 V and 100 V spike susceptibility category, we offer this high-power 600 V transient generator. The Solar Model 7054-2 Spike Generator delivers over 300 kW into low resistance loads. It has the flexibility and capability of the previous models, including the ability to shift the transient in phase to any position on the sine wave of the AC line feeding the test sample. The amplitude and the repetition rate are adjustable. The Model 7054-2 was especially designed for screen room use in applying high voltage transients at power line inputs to electronic equipment. The adjustable amplitude makes it possible to determine the threshold of susceptibility to spikes appearing on the power line. The Model 7054-2 may be used for performing tests per Method CS06 of MIL-STD-462, Method 5006.1 of MIL-STD-826A, various missile specifications and others. The Model 7054-2 also may be used to perform Section 17 testing of RTCA/DO-160G when used in conjunction with Solar Type 2201-1, 2201-2 and 2201-3 Impedance Matching Transformers. The peak amplitude of the Solar Model 7054-2 is adjustable from 10 V to over 600 V into 5 Ω. The source impedance is less than 0.5 Ω. 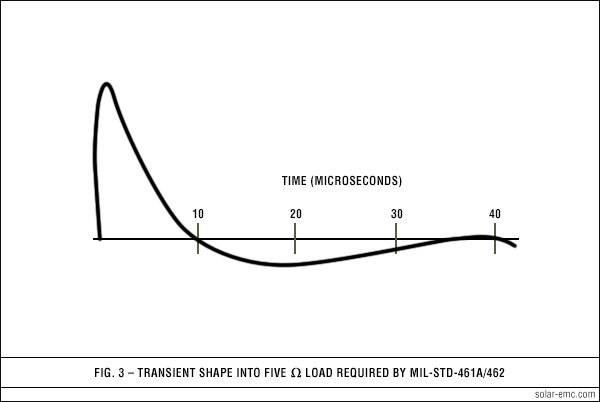 The transient shape approximates the curve given in Figure 19 of MIL-STD-462 with less than or equal to 2.0 µS rise time and approximately 10 µS fall time. On 50, 60 or 400 Hz power lines the transient can be applied in a periodic manner to the negative or the positive half-cycle of the power frequency. The transient's relation to the sine wave may be adjusted in phase from 0° to 360°. For non-synchronous injection on either AC or DC lines, the repetition rate can be adjusted from 0.8 pulse per second to 10 pulse per second. Single transients can be applied with the pushbutton on the panel. Two sets of output terminals allow either parallel or series injection into the power line. 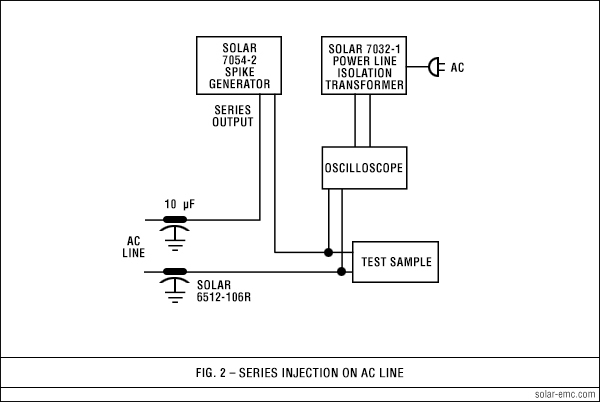 Series injection is used on AC lines. 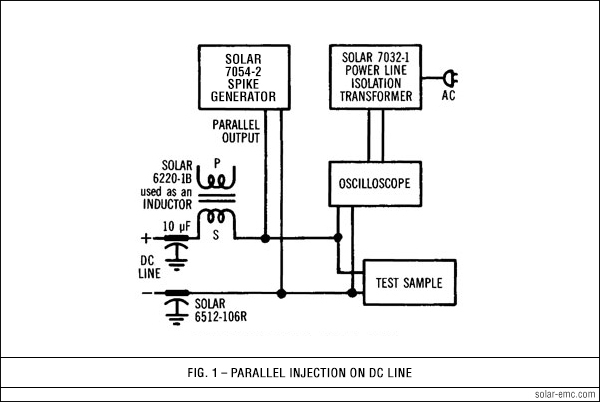 Parallel injection is used on DC lines. The output winding used for series injection can carry 25 A of power current. The output terminals are isolated from the chassis and the power cord. Waveshape falls to zero in approximately 50 µS. Provides 400 V peak into 5 Ω load. Handles 15 A power current. Waveshape falls to zero in approximately 120 µS. Provides 400 V peak into 5 Ω load. Handles 10 A power current.